Anxiety is a complex combination of negative emotion that includes fear, apprehension and worry, and is often accompanied by physical sensations such as palpitations, chest pain and/or shortness of breath. It may exist as a primary brain disorder or may be associated with other medical problems, including other psychiatric disorders. Anxiety is described as having a cognitive, somatic, emotional and behavioral components (Seligman, Walker & Rosenhan, 2001). The cognitive component entails expectation of a diffuse and uncertain danger. Somatically the body prepares the organism to deal with threat (known as an emergency reaction); blood pressure and heart rate are increased, sweating is increased, bloodflow to the major muscle groups is increased, and immune and digestive system functions are inhibited. Externally, somatic signs of anxiety may include pale skin, sweating, trembling and pupillary dilation. Emotionally, anxiety causes a sense of dread or panic, nausea and chills. Behaviorally, both voluntary and involuntary behaviors may arise directed at escaping or avoiding the source of anxiety. These behaviors are frequent and often maladaptive, being most extreme in anxiety disorders. However, anxiety is not always pathological or maladaptive: it is a common emotion along with fear, anger, sadness and happiness, and it has a very important function in relation to survival. 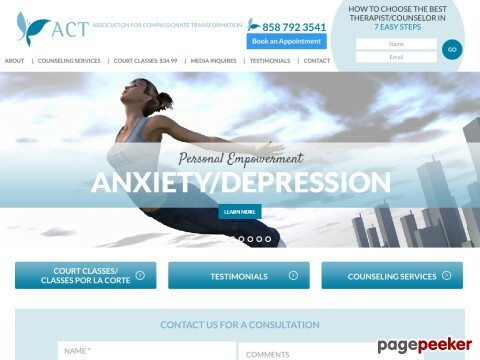 The Association for Compassionate Transformation is dedicated to empowering individuals, enriching lives, promoting personal growth and development by providing professionally competent and personally compassionate services for children, adults, couples and families through life-coaching, psychotherapy and education with the intent of achieving a productive life, a meaningful existence and realizing one’s highest potential.